This must be one of my most mysterious photos... While waiting for departure in Rayong, Thailand. I made this picture through the bus window. 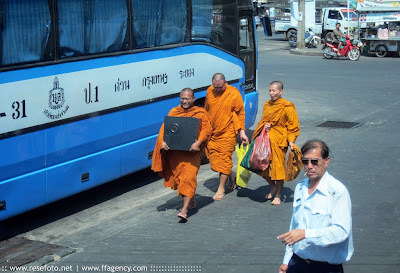 The monks look like they have been stealing a computer and happily gotten away with it. :-) And who is this Gadaffi look-a-like on the right? Photo: Anders Thorsell.